Kate James and Tom Evans said their son's death overnight in Liverpool, England had left them "heartbroken." Alfie's condition left him with almost no brain function, and multiple courts ruled that keeping him alive was not in his best interests before doctors removed his ventilator five days ago. "My gladiator lay down his shield and gained his wings at 02:30," Evans, 21, wrote in a Facebook post decorated with a broken heart and crying emojis. As news spread in the community, dozens of people laid flowers and mementoes in a park near Alder Hey Children's Hospital in Liverpool, where Alfie was treated. 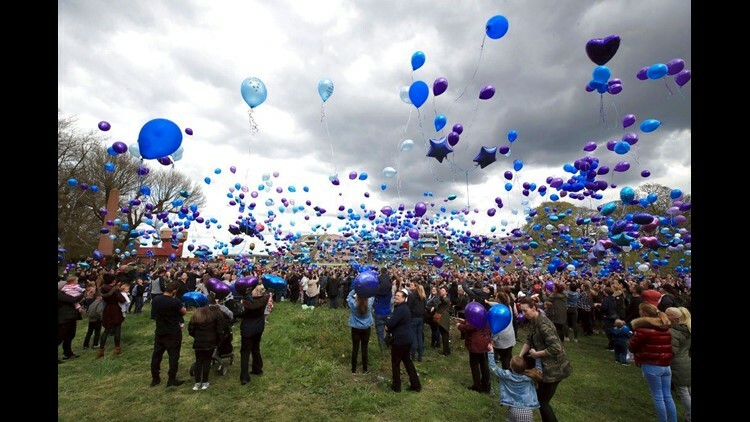 About 1,000 people gathered 12 hours after the boy died to release blue and purple balloons in solidarity with the grieving mother and father who had struggled to come to terms with their child's terminal illness. James, 20, posted a message on social media thanking everyone who supported the family through Alfie's illness and court fight. Alfie's case sparked a medical ethics debate that resonated far beyond Britain. Doctors overseeing his care said further treatment was futile and he should be allowed to die. But his parents fought for months to try to convince judges to allow them to take him to the Vatican's children's hospital, where life support would have been maintained. Under British law, courts are asked to intervene when parents and doctors disagree on the right course of treatment for a child. In such cases, the rights of the child take primacy over the parents' right to decide what's best for their daughters and sons. Pope Francis, who met with Evans and publicly supported the parents' campaign to bring Alfie to Bambino Gesu Hospital, wrote condolences that were posted Saturday on Twitter. "Goodbye, little Alfie. We loved you," Italian Foreign Minister Angelino Alfano tweeted Saturday. Tensions between the toddler's parents and the hospital had eased in recent days. Evans, who earlier said doctors were wrong about Alfie's prognosis and threatened to resume the court battle over his care, pledged to work with hospital staff to give his son "dignity and comfort" in his final days. "Our lives have been turned upside down by the intense focus on Alfie and his situation," Evans said Thursday outside the Liverpool hospital. "All of us feel deeply for Alfie, Kate, Tom and his whole family and our thoughts are with them," the hospital said. "This has been a devastating journey for them, and we would ask that their privacy and the privacy of staff at Alder Hey is respected." Alfie's case received widespread attention outside Britain, especially in predominantly Catholic countries. Francis recently appealed for the wishes of the boy's parents to be heeded, saying only God can decide who dies. Officials in Poland and Italy criticized Britain's courts and state-run National Health Service. A leading right-wing politician in Italy, Veneto Gov. Luca Zaia, said that in Alfie, the "so-called civilized world has supplied the latest proof of enormous incivility." Supporters of the parents staged angry protests regularly outside the hospital and tried to storm the entrance at times. Alder Hey asked for tributes to Alfie to be left in a park next door so the hospital's work wasn't disrupted.